Front Runner Focus, finding back-to-lay horses - Exchange Trading, Sports Tips And Crypto. Here at Juicestorm we are always on the lookout for angles to help our readers when trading. This DAILY feature — looking at horse racing front runners — gives you a helping hand for all of you ‘back-to-lay’ traders..
Front Runner Focus is sponsored by BetTrader from RacingTraders. BetTrader is a Betfair sports trading application for PC and Mac. 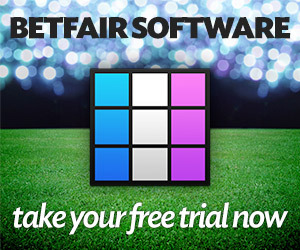 An enhanced betting & trading interface the sports betting Exchange, Betfair. What is Front Runner Focus? With the introduction of in-running trading some time ago, and the odds feeds from the exchanges getting quicker all the time, then there has been no better time to be a trader. If you are an experienced trader or just learning the ropes we still feel this info will be of use. Researching the make-up of certain races can certainly help give you an edge when trading, so one tip is to look back at past form – especially for some of the more-fancied runners in the fields – and record their recent running styles. If certain horses like to lead in their races and there are no other potential front-runners then there can be some great trading opportunities to be had. Generally, the horses that lead at the start of the race, or break well, will shorten-up in the in-running market – meaning as a trader you can factor this in before the race. If you know there is a strong chance a certain horse will lead in a race then you’ve an angle to place a ‘BACK’ trade just before the off and then trade-out early on in the race at shorter odds. You can then either hedge the profit across all the runners in that race or let the free trade run solely on that horse. So download a copy of of the Sports Trading Software BetTrader from RacingTraders and get trading! Yes, we can’t guarantee this pattern of the odds shortening, or even these horses leading all the time, but what we can do is find out for you potential FRONT-RUNNERS to look out for each day. Note: Whereas every effort will be made to update this page daily there might be some days with no selections listed. There are 142 Guests online and 86 Members Logged In currently reading JuiceStorm.com. Welcome everyone. Join TradeChat for a chance EVERY month to win a year's subscription to TradeSelect - worth £600!